A visitor views "Portrait of an Artist (Pool with Two Figures)" by David Hockney during a press preview for the British artists' retrospective at Tate Britain on Feb. 6, 2017, in London. (CNN) - On Thursday, a well-known painting by British artist David Hockney is poised to smash the record for a work by a living artist sold at auction. "Portrait of an Artist (Pool with Two Figures)" is set to be sold at the Christie's Post-War and Contemporary Art Evening Sale in New York on for an estimated price of $80 million. The current record was set by Jeff Koons in 2013, when his "Balloon Dog" sold for $58.4 million. Alex Rotter, co-chairman of post-war and contemporary art at Christie's, called the 1972 painting "one of the great masterpieces of the modern era." 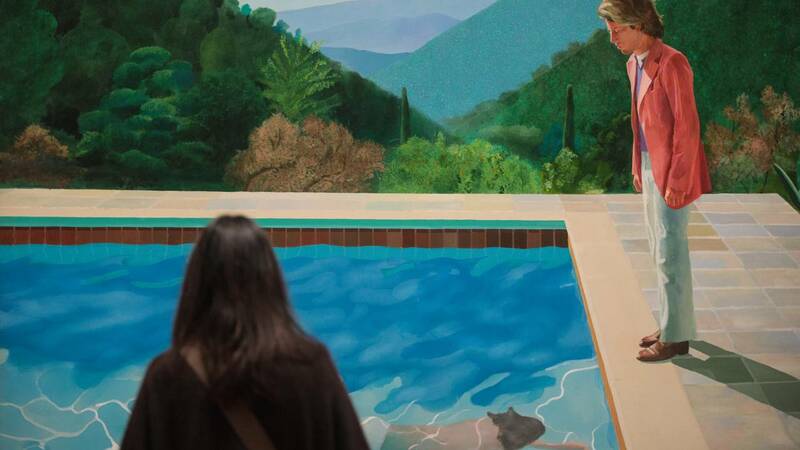 "David Hockney's brilliance as an artist is on full display with this monumental canvas, which encapsulates the essence of the idealized poolside landscape, and the tremendous complexity that exists within human relationships," Rotter said in a statement. "With this painting, Hockney cemented his placement within the realm of history's most venerated artists." Now 81, David Hockney is regarded as one of the world's most popular artists. Well over a million visitors to his attended his last retrospective, hosted by Tate Modern, the Metropolitan Museum of Art and the Pompidou Center in 2017 and 2018, and his current auction record stands at $28.5 million. Swimming pools have been one of the artist's muses since he first moved to California from England in 1964. "I always loved swimming pools, all the wiggly lines they make," he told CNN in 2017. "If you photograph them, it freezes them whereas if you use paint, you can have wiggly lines that wiggle." "Portrait of an Artist (Pool with Two Figures)" has long been in private hands (Christie's has not revealed the identity of the seller) but is still one of Hockney's most recognizable works. Ahead of its sale in New York on Nov. 15, the painting was exhibited in Hong Kong, London and Los Angeles.